You find yourself strolling down the beautiful downtown streets of whatever city you live near. As you are walking, a man extends his hand to you in an attempt to stop and engage you. He is well groomed and clean. A fancy watch clings to his wrist from his extended hand. His face is familiar, and within a few brief seconds you recognize him. Do you make eye contact? Do you stop? Do you engage? Go ahead…you can answer to yourself. Now, picture yourself on those same beautiful streets. As you walk another man extends his hand to you looking for help. He is dirty and disheveled. Torn gloves cling to his extended hand. His weathered skin hides beneath the dirt and facial hair. Do you make eye contact? Do you stop? Do you help? We’ve all heard the urban legends about men panhandling by day and living lavish lifestyles by night. It’s a job, so we’ve been told. We’ve all stumbled across the drunken homeless man and used his stereotype to justify why we shouldn’t help anyone. It’s a negative empowerment, so we’ve trusted. We’ve all seen the dirt and decay of life on the streets embedded deep into their clothes and bodies. We might catch what they have if we get to close, or so we’d like to believed. So we move on, with our heads down. We give short responses and leave inhumane remarks. We treat them as objects rather than as people. We’ve been conditioned and we feel we can fearlessly conquer the streets of our city without having to worry about the lesser among us. Yet something really scary happens if you do stop to engage yourself with a homeless individual. They touch you somewhere that it hurts, in your heart. For the majority of my life I’ve allowed the conditioning of society to dictate how I respond to the homeless men and women I encounter. It was a broken, non-Christlike response to the world around us. It allowed me to remain disengaged and comfortable. Yet the further I followed Christ and the more I soaked in His teachings; the less I was able to reconcile my response. The deeper I went the more Jesus’ radical teachings began to take root into me. Serving those who can’t repay us. Loving those who don’t love us. Maintaining the rights of the destitute. So as I began to let these thoughts take root in me in I realized I had to approach people differently, even those I wasn’t comfortable with. I remember once when I was downtown Nashville with a short window of time to show a friend our grand city and a homeless man approached us. We had plenty of reasons to dismiss him and continue on our trek. This was my invitation to love like Jesus taught. 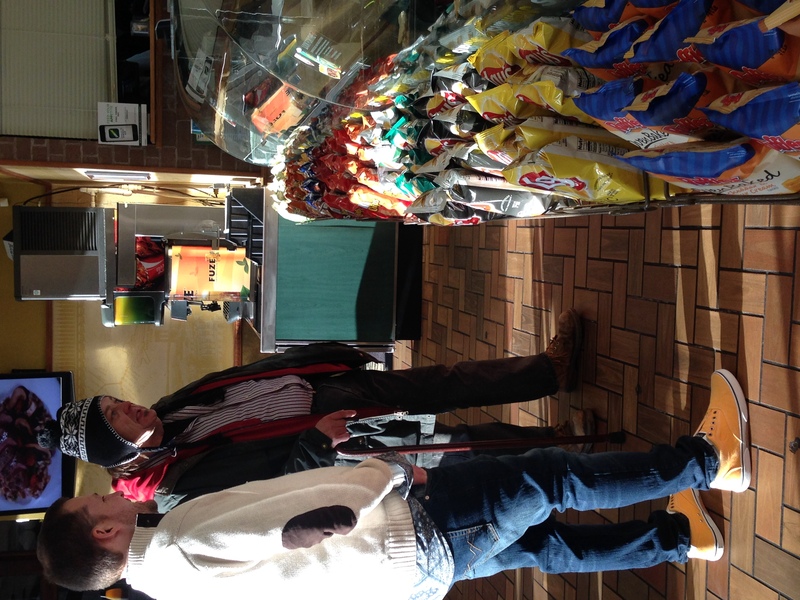 Instead of seeing the city we took this man on a journey to the meal of his choice. Subway. It was a long walk, many blocks over from where we were. So as we journeyed, we talked. My new friend shared his story with me. How he wound up homeless, and in Nashville. We talked about his struggles with depression and self worth. His attempts at suicide. It was a heavy walk. 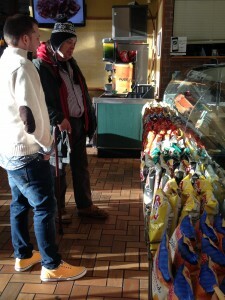 Once we made it to Subway I told him to get as much food as he wanted for he and his wife (who was back at their tent). Afterwards, I shared with him why I did what I did. Because of God’s crazy love for him. It is amazing how your perspective changes when you step into someones story. It isn’t a choice. Most don’t want to be where they are but they hit circumstances beyond their control. The realization set in that each of us are just one moment away from being in his torn and worn shoes. Each face that we pass could be our face begging for help. It could be our parent’s face. Or a friend. Or a child. Yet we continue to write them off. We cast labels and judgements. We leave them starving and cold on the corner, void of any opportunity to have relationship and experience love. The very next day I was downtown again (albeit I do not head downtown all that often) and encountered another man in front of the Farmer’s Market. In our conversations, before we parted ways for me to head into the Farmers Market, he shared with me it was his Birthday. Once in the Farmers Market I noticed a cupcake stand and I began to brim with excitement. I stopped in the middle of my meal and ran over to the stand to buy a chocolate cupcake. After the meal myself, and the guys that were with me, walked back up to the corner to where he was standing. I handed him his cupcake as we all stood around singing him Happy Birthday. He lit up like the sun. The reality is, homeless people don’t just need our charity, they deserve our love. Yet for whatever reason, as we follow Christ we look for outs as to why we don’t have to love. Just like the law scholar who asked Jesus who his neighbor was, we look for ways out of loving everyone around us. We try to find the loophole. To follow Jesus means to love those who can’t reciprocate. It means to love those that agitate us and anger us. It means to love those that we disagree with. Love is love, to all people, at all times. So next time you encounter a homeless person beware, they may just touch you where it hurts. Your heart. And remember, it could be you or I sitting on the corner looking for the same type of love and help they need one day.